20-year incumbent Leslie Hairston holds a narrow lead in the Fifth Ward aldermanic race against challenger William Calloway with 50.8 percent of the vote. Calloway earned 49.2 percent of the vote, with 97.56 percent of precincts reporting as of 10 p.m. on Tuesday. As of Tuesday night, the results of the runoff were as yet undeclared. Whether or not Calloway would seek a recount was unclear as of 11:45 p.m. on Tuesday, as he said he would need to consult with his team. He did, however, promise not to concede until the Board of Election Commissioners finishes counting every vote, including mail-in ballots, the Hyde Park Herald reported. Calloway said he would not make a decision on asking for a recount until after mail-in ballot votes are counted—and even then, he would need to speak with his team. His communications director Kelsey Kruzel said the decision would be based on information about potential machine errors and other potential problems in the vote-counting process. On election night last February, both the Calloway and third-place finisher Gabriel Piemonte campaigns heard unconfirmed reports of machine errors from poll workers pulling plugs on them in the fifth precinct of the ward. This has been the closest race in Hairston’s five-term career as alderman, and her only runoff election since she won the seat in 1999, defeating incumbent Barbara Holt. Calloway’s loss comes after a challenging close to the campaign, which was clouded by the publicizing of Calloway’s homophobic 2015 tweets after the Supreme Court validated gay marriage. At a Q&A session about the tweets held at the Hyatt Place in Hyde Park last week, Calloway said that his views have changed since 2015 and referenced his Christian background. However, at his election party, Calloway did not say he disagrees with the views he expressed in the posts, only saying that he has evolved in his beliefs. Calloway characterized the controversy as a distraction from the election. “I think the Facebook posts was [sic] a distraction from the policies and the issues that we were facing in the ward,” he said. Calloway also separated his religious beliefs from how he would run the ward if elected. “I’m sure some people were upset, some people who don’t know me or don’t have a personal relationship with me, especially if they’re not from the LGBT community. But for the most part I think people...know where I stand. They know the difference between my biblical values and how I will govern if I was [sic] elected,” he said. Calloway distributed copies of a 100-day plan detailing the first moves he plans to make as alderman at a meeting held at the Experimental Station on Sunday, two days before Tuesday’s election. The plan—drafted with the “huge help” of Piemonte—included monthly meetings with all local school council heads and “wellness checks” on residents of the ward. 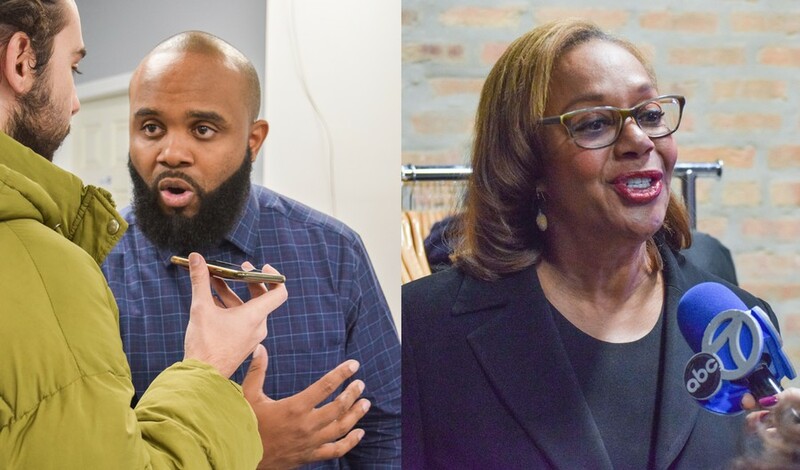 “I want the Fifth Ward, which is the greatest ward in the City of Chicago...to be the leading ward on everything innovative and everything related to the people in regards to progression,” Calloway said on election night. Hairston, who has been in office since 1999, has brought a number of developments to the ward, including the $162 million renovation of South Lake Shore Drive, the founding of Comer Children’s Hospital, and a skating rink on the Midway. Upcoming arrivals in the ward also include a Shop and Save Market grocery store, set to open this fall. Hairston also recently voiced support for a Community Benefits Agreement (CBA) for the forthcoming Obama Center. The decision, which she attributed to the results of the ward’s overwhelming support for a CBA ordinance in the February general election, marks a reversal from Hairston’s longtime opposition to the measure. However, Hairston maintains that her support does not represent a shift in policy to being pro-CBA. Instead, she referred to an open letter she wrote to the Obama Foundation in 2017 asking the foundation to ensure community members are protected from any adverse effects that may arise. “I will clarify, as I’ve said in my first letter, that I support it. But I support that the people, the stakeholders are at the table, and right now all of the stakeholders are not at the table,” Hairston said in an interview with WGN on election night. “She does a lot to bridge the neighborhoods together,” Gilliam continued, referencing the South Shore Summer Festival. Pittman added that she was unconcerned with Calloway’s projected boost in support, even though many had predicted that Piemonte’s supporters would transfer their votes to Calloway in the runoff. “[Piemonte] never had a presence in the ward before.... If you go five blocks down, nobody would even know his name,” she said.